Gas is expensive and there’s no way around it. The best way to fight gas prices is to maximize your gas mileage. Here are three ways to dramatically increase your gas mileage for free by just changing a few driving habits. 1. Excessive acceleration uses LOTS of gas. Excessive acceleration requires a lot of gas. If you want to save on gas, then just ease up on your acceleration. You can still drive the speed limit, just take it easy on the gas pedal. 2. Speeds above 60 mph hurt MPG. Did you know that driving faster than 60 mph will lower your MPG? The faster you go over 60, the lower your MPG. Driving too fast will hurt your fuel economy. Keep that in mind on your quest to maximum gas mileage. 3. Excessive idling wastes gas. The longer your vehicle idles, the more gas your vehicle will use. 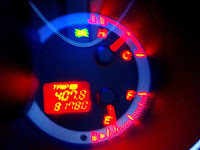 An easy way to save on gas is to turn off your engine when you stop for longer periods of time. There’s no need to turn off your vehicle at every red light, but, if your vehicle is going to be stopped for more than a couple minutes, consider turning it off. Jiffy Lube of Indiana will also boost your MPG by helping maintain your vehicle. Just drive on in, our expert technicians will be glad to help.